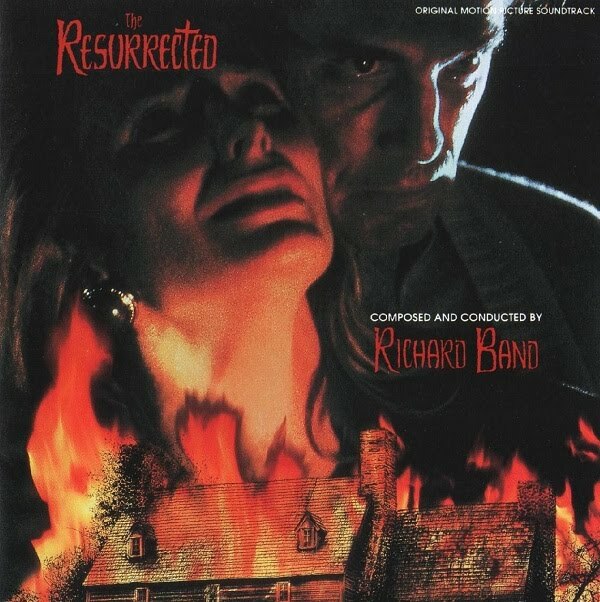 Lovecraft fans rejoice, for today you get awesome music from The Resurrected by director Dan 'O Bannon (RIP), which was based on The Case of Charles Dexter Ward. If you have not seen it, and I am sure most H.P. Lovecraft fans have, it is highly recommended that you do. The whole production is top-notch, and Richard Band delivers once again. If you missed the previous Lovecraft/Band albums on this blog, take a minute to do a search because his work is excellent and criminally underrated. Upon receiving this assignment, one of the elements I found most intriguing was how I could use a combination of orchestral instruments and electronics to create and ever-widening effect as they descended into the bowels beneath Charles Ward's house. I loved the fact that as they descended to one level, there was still another lower level and another, and so on. This allowed me to use such devices as having the clarinets, bassoons and celli echoing pizzacato effects, then turning into bass clarinets, contrabassoons and basses when reaching yet another level. With each level reaching deeper and deeper, I attempted to have the music follow suit, getting lower, slower and more menacing but always trying to maintain a sense of impending discovery. The orchestral devices mixed with the thematic structure climax upon reaching the lowest level, where the mutations resided, thus allowing me to once again reverse direction musically as they hurriedly ascend... escaping the inevitable fate of the ancient tomb. FLAC upgrade available upon request. Another great Richard Band soundtrack that I didn't already have. Thank you for providing me with the opportunity to listen to this Strange Ranger. I see you've caught on to the custom HTML/CSS code used on the blog rather quickly, which is great. I look forward to seeing what you have in store for the rest of December. Piece of cake, Zer0_II! I think you'll definitely enjoy this one, too. MANY THANKS FOR THIS ! Could I ask for a FLAC upgrade ?